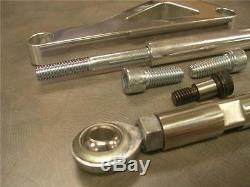 Small Block Chevy Aluminum Alternator & Power Steering Brackets SBC Chevrolet. This is a brand new polished aluminum Chevy alternator and power steering pump mounting bracket set. This is a great new way for you mount the alternator and power steering pump on your small block Chevy engine. This set is designed for use with a LONG water pump. We do not have the brackets for the short pump yet. This beautiful POLISHED ALUMINUM bracket mounts the alternator on the passenger side of the engine. Check out the picture and see how thick and heavy duty the bracket really is. Remember, this product is 100% brand new. It is very easy to install and is much lighter and stronger than your OEM bracket. It includes all the install parts shown in the picture, including the pivot style adjustor rod with adjustable heim end. This adjustor makes the bracket much stronger and easier to adjust. This is nearly identical to the kit that Zoops sells for three times the price. It includes all the install parts shown in the picture. Instructions are not included, so please have it professionally installed or search the web for the installation guide. New parts are being added daily! Whether you're a novice rodder or an experienced builder, there is something here for you! Please wait for us to send you a combined invoice before paying. We have discount prices on thousands of parts for your Street Rod, Hot Rod, and Custom Car or Truck. Parts are added to our store daily, so check back often for the latest deals! Plus, we have access to thousands of parts that are not listed. We do get hundreds of emails daily, so at times it may take us up to 72 hours to respond to your emails. The item "Small Block Chevy Aluminum Alternator & Power Steering Brackets SBC Chevrolet" is in sale since Wednesday, May 8, 2013. This item is in the category "eBay Motors\Parts & Accessories\Car & Truck Parts\Engines & Components\Belts, Pulleys & Brackets". The seller is "gearheadworld" and is located in Hudson, Iowa. This item can be shipped to United States, Canada, United Kingdom, Australia, Mexico, Germany, Japan, Denmark, Romania, Slovakia, Bulgaria, Czech republic, Finland, Hungary, Latvia, Lithuania, Malta, Estonia, Greece, Portugal, Cyprus, Slovenia, Sweden, South Korea, Indonesia, Taiwan, South africa, Thailand, Belgium, France, Hong Kong, Ireland, Netherlands, Poland, Spain, Italy, Austria, Israel, New Zealand, Philippines, Singapore, Switzerland, Norway, Saudi arabia, Ukraine, United arab emirates, Qatar, Kuwait, Bahrain, Croatia, Malaysia, Brazil, Chile, Colombia, Costa rica, Dominican republic, Panama, Trinidad and tobago, Guatemala, El salvador, Honduras, Jamaica.